Well-designed environments for healing incorporate daylighting, non-toxic materials, finishes, and furnishings; and views of green space. 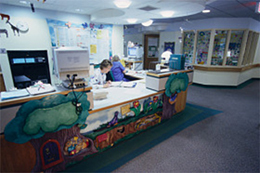 Well-designed common play areas offer children and families space for activity and rest. The ideal space would have flexibility with moveable furnishings and activity materials. Natural elements, such as a fish tank or water feature, help to calm concerned parents and anxious children. Ideal spaces provide features that enhance children’s sensorial experiences, such as rich textures, smooth finishes, pleasing color accents, and calming music.